The lack of Lotus Notes collaboration, relational data services and searchability has produced an “application sprawl” for many organizations of hundreds, even thousands of Notes applications that are unmanaged and unmonitored. Typically, Innovative Architects has found that most clients using Lotus Notes has an average inventory of more than 1000 Notes applications. Not only is this costly from a licensing perspective but also from a pure infrastructure perspective. 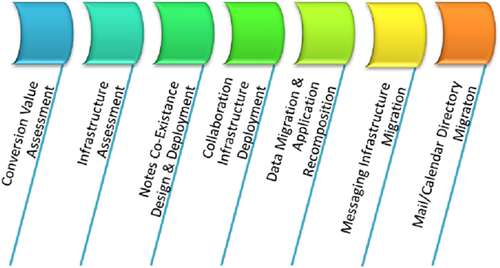 The value in migrating from Lotus Notes to SharePoint, though, is best realized not through an infrastructure perspective but through an understanding of Microsoft’s collaborative ecosystem or what Innovative Architects terms the Enterprise Collaboration Framework (ECF). Application development platform that is ideal developing distributed applications such as product lifecycle management, benefits enrollment and compliance policy management. Innovative Architects leverages what is termed as the Lotus Notes Transition Framework that provides a common framework for assessing complexity and risk of converting Lotus Notes applications to SharePoint. This framework also provides tools for safely automating the process of converting Notes applications, data and messaging services.